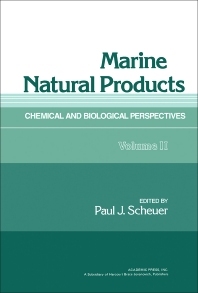 Marine Natural Products: Chemical and Biological Perspectives, Volume II, reviews the state of knowledge in the chemistry and biology of marine natural products. It attempts to bring together timely and critical reviews that are representative of major current researches and that, hopefully, will also foreshadow future trends. The first three chapters of this volume deal with marine carotenoids, steroids, and diterpenoids. This is followed by a chapter that examines a single phylum, the Coelenterata, and its metabolites. The Coelenterata is an almost exclusively marine phylum of some 9000 described living species. Research predicts that the coelenterates will yield a rich harvest of organic metabolites. The final chapter, which focuses on 13C NMR spectroscopy for structural elucidation, reveals the power of this instrumental method especially when applied to the difficult problems of polyhalogenated marine metabolites.